Ari Minkov (13.0) won the Kenilworth Summer Tournament last night; ahead of Greg Tomkovich (11.0) & Mark Kernighan (10.5). While Mark was beating Ari & Greg was losing to Max Sherer, I tried to catch-up by playing a 2-board simul. Unfortunately, after winning against Jim Cole, I made a time-pressured, touch-move blunder in an equal position, lost to Joe Demetrick & finished 4th, at 10.0. Max also upset Ed Selling to move past idle Pat Mazzillo & grab 5th place. Here are 3 of the 5 last-round games in PGN; plus the final standings. I'll upload a replay page tonight. broken standings link repaired 8/31 at 11:00 a.m.
java-replay uploaded 9/1 at 12:45 a.m.
fully annotated version of Cole-Moldovan uploaded 9/4 at 4:20 a.m. I just realized that the PGN links given for rounds 10-12 of the Kenilworth Summer Tournament were broken! Apparently, when writing post #184, I typed kst_r10.zip, instead of the proper KST_r10.zip, & subsequently copied the mistake into #188, #190, #191 & #192. 56.Bxg7 Bxf2+?? (56...Nxf2 += was right.) 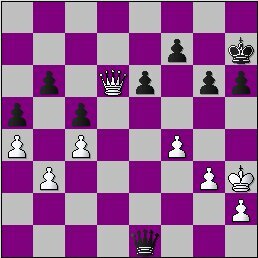 57.Ke2 Bd4 58.Bxh6 Nc5 59.Bc8?? (59.h4 would've won.) 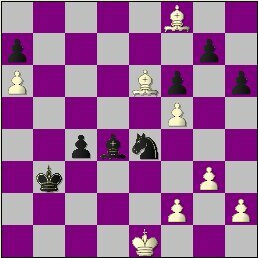 c3 60.Bc1 = but 2 moves later White hung his dark-squared B. Updated 12th-round replay & PGN. With 1 week to go in the Kenilworth Summer Tournament, Ari Minkov (13.0) needs just a half-point to wrap up 1st place and Greg Tomkovich (11.0) is 1 point away from sealing 2nd. Last night, Ari won a hard-fought game against me... Greg beat Pat Mazzillo... NM Mark Kernighan (9.5) moved into sole possession of 3rd by drawing Ed Selling... and Joe Renna split a pair of games with Max Sherer. Here are all five 12th-round games (! ), including my fully annotated loss, in Java-replay & PGN; plus the updated standings. Notes to Cole-Selling are now online... in Java-replay & PGN ... along with a revised version of my loss to Sherer. There were a couple of surprises in the final round of the John Hoffman Memorial Swiss last night but not in the battle for 1st place where, as expected, top seed NM Mark Kernighan defeated Bob Sherry to finish at 3-0, 1 point ahead of Bob, Joe Renna & this reporter. 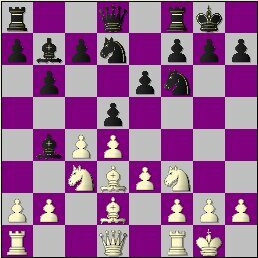 Mark used his pet line against the Nimzo-Indian (4.Bd2), caught his opponent in an opening trap (8...Nbd7?! 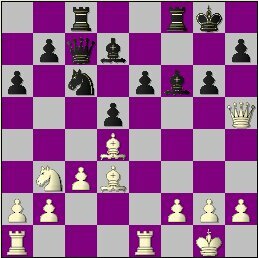 - see 1st diagram) & stole a pawn with 9.Nxd5! 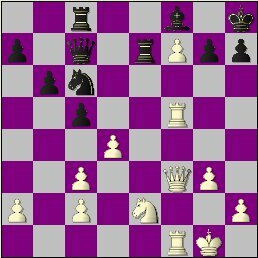 Black had partial compensation for the loss & tried to whip up an attack against White's drafty King but 13...Qg5+?! (N; 13...c5 +=) gave his prey a free step toward safety & 14...Rf6? allowed consolidation. 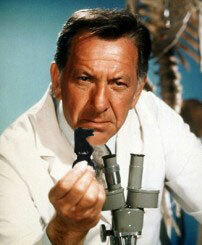 As for the upsets... Joe won when Ted Mann allowed his Royal couple to get forked (23...Rxc4??) 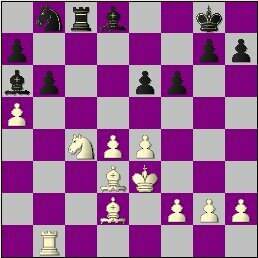 & I convincingly beat CCC Champ/KST leader Ari Minkov (next diagram); who, I'm sorry to say, gracelessly refused to offer a cursory "gg" afterwards. Anyway, before my Sicilian blood comes to a full boil, I'd better give the links for the final standings, java-replay & zipped PGN. Notes to my game (& perhaps more) will follow at some point. Ari Minkov (12.0) extended his Kenilworth Summer Tournament lead with a victory over 2nd-placed Greg Tomkovich (10.0) &, with 2 weeks to go, now has a 2-point lead. 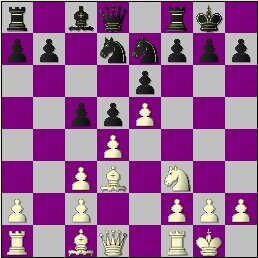 In other games, Mark Kernighan (9.0) overcame a lost position & time-trouble to beat Joe Demetrick, I was axed by young Max Sherer (my first loss in the event) & Ed Selling defeated Jim Cole. Notes to Max's win will appear in the late Friday/early Sunday time-frame & those to Ed's should be ready for posting late Tuesday to early Thursday. For now, here are the raw scores in Java-replay & PGN; plus the updated standings. Sherer-Moldovan notes uploaded Sat. 8/18 at 12:05 a.m. The STC Bunch, an organization for internet chess players preferring Slow Time Controls (G/45 or longer), resumes running major events with the 2007 STC Gauntlet, a free 4-round knock-out tournament which starts August 27th. sign-up for The Gauntlet by August 25th. The time control will be G/60 + a 15 second per move increment. Full rules here. NM Mark Kernighan & Bob Sherry lead the Hoffman Memorial with one week to go. Mark had an easy time against Ted Mann last night but Bob was outplayed by Joe Renna much of the way & should've lost. You can replay those games & the rest from round 2 now or download the PGN for later viewing. Kernighan-Bilenky has been added to the 10th round files. Please refer to post #184 for links. post corrected 8/14 @ 7:10 a.m.
Ari Minkov & Greg Tomkovich each won 2 games Thursday while I struggled to beat Harry Smith & NM Mark Kernighan lost to Mark Bilenky. So, with 3 weeks to go in the Kenilworth Summer Tournament, Ari leads with 11.0 and Greg is 2nd with 10.0. Here are the full standings plus a selection of the week's games in Java-replay & zipped PGN. Factoid : Minkov has already surpassed the 10.5 scored by last year's winner (Tomkovich) & this event's top 4 point-getters have collected 57% of the points (38/67) compared to 2006's contenders' 43% (37/86). I have annotated last week's Cole-Tomkovich & round 7's Cole-Sherer. NM Mark Kernighan, Bob Sherry, Ted Mann & Joe Renna lead after 1 round of the Hoffman Memorial Tournament in Springfield. Ari Minkov, Bert Shiffman, Joe Azzarello & I are also involved. My loss to Kernighan is the only game I have at this time. Here it is in Java-replay & PGN. Yesterday, on the long trip to the U.S. Open in Cherry Hill, I passed time & kept my mind busy by playing a simul vs. Don Varneckas & Rooney Simonaitis. My game with the latter (a loss) was a blindfold affair! Here are both parties in Java-replay & PGN. Thanks to Ziggy Bliznikas for allowing me to tag along & apologies to Ari Minkov & Don for making their ride crowded & uncomfortable. BTW, Maraj Daftani, David Grasso (Roselle CC), Jonathan Cohen, Bill Cohen (Westfield CC), Don Carrelli (Checkmate CC) Mike Wojcio (Kenilworth CC) & Glen Hart are among the locals playing in the Open. The Kenilworth Summer Tournament standings got a little tighter last night as Ari Minkov & I played to a draw while NM Mark Kernighan & Greg Tomkovich notched full points. Ari, who has led for all but 1 week, now has 9.0. Greg (who missed a share of 1st with a loss to Jim Cole), Mark & this reporter are a point back, at 8.0. We had the same configuration (Minkov clear first/3-way tie for 2nd) after round 6! In the evening's only other game, Joe Demetrick's Caro-Kann dealt the Caveman Attack another setback. Here's my lousy yet half-successful effort (with notes), + the Kernighan, Tomkovich & Cole wins in Java-replay & PGN. I'll annotate & upload Jim's big upset before next Thursday & try to get Joe's victory for you, too. BTW, 37 of 61 games (61%) have been collected from this event compared to last year's 33 of 86 (38%). Keep those scores coming!! Why am I obsessing over that game when I should be preparing for tonight's?? ?